The Augusta National Golf Club, renowned for its exclusivity and fervent adherence to a strict Dudes Only policy, has finally broken its nearly 80-year streak of not having any female members and admitted two women: former Secretary of State Condoleezza Rice and South Carolina businesswoman Darla Moore. Great. Now the golf course is going to be littered with tampons. Augusta has come under fire multiple times in its history, first for having a staff of entirely black caddies and a membership of entirely white men, then for not allowing black people to join (relax, people; they let a black guy in in 1990, which was, like, barely after the Civil War ended). In recent years, the Club's lack of female members drew scrutiny. In 2002, Martha Burk, then the chair of the National Council of Women's Organizations, wrote a private letter to then-chairman Hootie Johnson, accusing him of sexism. In response, Burk says she was called a man-hater and a lesbian by defenders of Augusta. And this year, the shitstorm began anew when IBM named a lady, Ginni Rometty, to be its CEO. IBM is a corporate sponsor of the Masters, which is played at Augusta, and in the past, the Club had granted membership to sponsor companies' CEOs. But, then again, those CEOs had penises. When pressed on the issue, Club chairman Billy Payne crossed his arms over his man-chest and said they weren't going to talk about letting ladies in; not no way, not no how. 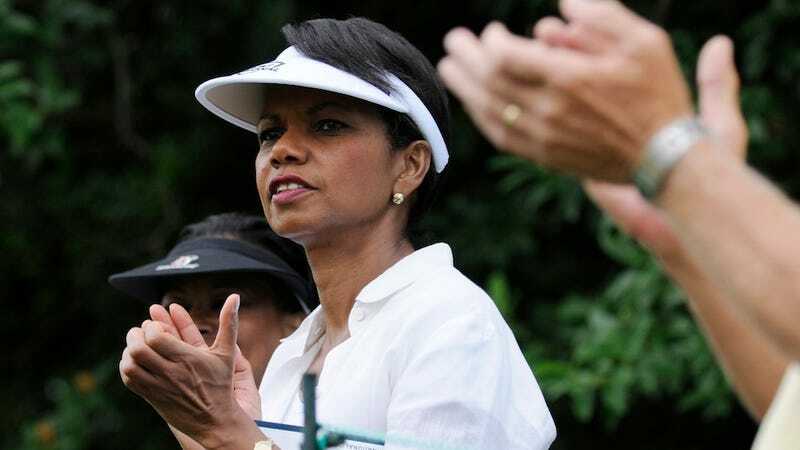 This is a joyous occasion as we enthusiastically welcome Secretary Condoleezza Rice and Darla Moore as members of Augusta National Golf Club. We are fortunate to consider many qualified candidates for membership at Augusta National. Consideration with regard to any candidate is deliberate, held in strict confidence and always takes place over an extended period of time. The process for Condoleezza and Darla was no different. These accomplished women share our passion for the game of golf and both are well known and respected by our membership. It will be a proud moment when we present Condoleezza and Darla their Green Jackets when the Club opens this fall. So the days of men at Augusta being free to scratch their balls and belch and tell "Take my wife; NO REALLY, take my wife!" jokes over a good laugh and some cigars are numbered. And now never again can Augusta be accused of sexism — they have two female friends.